It’s been raining a lot lately and sometimes it’s tiring to really muster up something to cook. After working and traveling for such a long time, sometimes, the last thing you’d want is fixing up a meal. Yesterday, I tried cooking curry at home and I almost chopped my finger off when I dropped my cleaver. ^^;; Anyway, that aside, there is a nice and easy fix that I cook up on those colds nights when you just want to be fed a nice warm meal without having to worry about slicing and dicing. This is my Speedy mee. I call it speedy because it’s quite fast to make it. And requires no chopping at all. Only a bit of patience to boil the broth. The broth can be your choice of beef, pork, chicken, fish, or if you want, sinigang broth (add chili sauce to make it like Tom Yam). In this bowl, I used instant katsuo dashi stock and konbu, giving it a more Japanese feel. 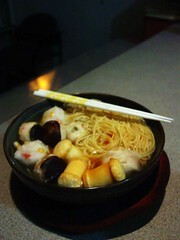 The fish balls and stuff can be bought from the nearest SM Hypermart. Same goes for the noodles which are just wantan egg noodles. These are easy peasy ingredients and can be variated with the inclusion of vegetables or even roast pork/barbecue on top. I also placed drops of chili oil on it because it’s nice to eat spicy things during the warm weather. To be honest, this is just an upgrade version of the usual instant noodles. Well, it never hurts to take a break from the usual, ne?